The first few steps of glycolysis involve relatively minor changes. The sugar is phosphorylated, at two different stages, and a couple of keto-enol tautomerisations are employed to move the carbonyl position one carbon down the chain. The carbonyl migration allows the fructose molecule to undergo a scission or cleavage, in which the molecule is cut in half. That gives a couple of three-carbon sugars. Three-carbon sugars like these are important in phase two of glycolysis, the energy-producing phase. Figure GL4.1. Cleavage of fructose into two three-carbon sugars. To understand how the molecule splits in two, we're going to imagine a complementary case, because it might seem more familiar. The reaction shown below is called an aldol reaction. That's the one in which an enolate ion, with a negatively charged carbon next to a carbonyl, donates to a regular carbonyl. The enolate ion acts as the nucleophile, donating electrons to the neutral carbonyl, which acts as the electrophile. The electrophilic carbonyl pops open to make an alkoxide ion, which then picks up a proton to make the alcohol part of the aldol product. Figure GL4.2. A simple aldol reaction. Show why the enolate ion is very stable, even though other carbon anions typically are not easy to form. The products of aldol reactions bear a pattern that is easy to spot: there is always a carbonyl-carbon-alcohol sequence, O=C-C-C-OH. The middle carbon was the nucleophilic carbon; the carbon attached to the OH is the former electrophilic carbonyl carbon. The thing is, aldol reactions are reversible. They can go backward again, re-forming their starting materials. So if you look at an aldol product, with that carbonyl-carbon-alcohol sequence, you can imagine the molecule splitting apart, with a break between the middle carbon and the alcohol carbon. Figure GL4.3. Retrosynthetic analysis of an aldol reaction, showing how a compound could be formed via an aldol reaction. The open arrow in the picture above is a specific symbol in chemistry that means "can be made from". The aldol product can be made from the enolate and the carbonyl. But if an aldol reaction is reversible, then the reverse is also true: an enolate and a carbonyl can be formed from an aldol product, characterised by its O=C-C-C-OH pattern. This reverse reaction is called a retro-aldol reaction. Predict the precursors that could be used to form these compounds through aldol reactions. What makes retro-aldol reactions possible? The same thing that made the forward aldol reaction possible: the stability of an enolate anion. Carbon-carbon bonds are actually pretty difficult to break, because the pair of electrons forming the bond aren't likely to shift one way or the other. The enolate provides a release mechanism. A pair of electrons can shift to the carbon next to the carbonyl, or the alpha position, because they will form a stable anion there. Figure GL4.4. Frustose-1,6-bisphosphate depicted as a nucleophilic aldol precursor (red) and electrophilic aldol precursor (blue). The enolate ion that would result from a retro-aldol reaction of FBP would be stable because the negative charge is delocalised. That charge delocalisation of an enolate anion is part of what makes retro-aldol reactions possible in the first place. You can't just have a C-C bond break in a random place and have one of the carbons form an anion; that would never happen. If the anion is somehow stabilised, however, then that changes everything. Figure GL4.5. A key resonance structure. Provide a mechanism for the retro-aldol reaction of fructose-1,6-bisphosphate. That's not the whole story, though. In reality, the retro-aldol reaction of FBP undergoes iminium catalysis. That means the reaction is accelerated through the action of a lysine residue in the enzyme, fructose bisphosphate aldolase. 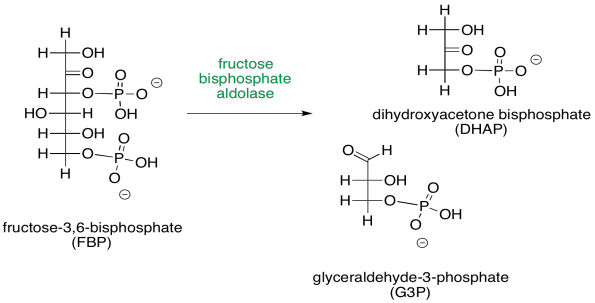 The lysine, which contains a nucleophilic amine side chain, transforms the carbonyl of fructose-1,6-bisphosphate into an iminium ion. Biochemists often call this kind of structure a Schiff base. Its structure is very similar to the original, but it contains a C=N group instead of a C=O group. At common biological pH, chances are that the nitrogen in the Schiff base is protonated. How does that help things? Well, charge stability is always a key factor during reactions. It costs energy to stabilise charges. If we can avoid generating the negative charge of an enolate anion, even though it's relatively stable, that might make things easier. The Schiff base is already positively charged because of its basicity, so when it accepts a pair of electrons it becomes neutral. It has no charge to need stabilising. That step ought to be less difficult than a similar step that results in an anion. So, by adding a couple of steps to the reaction -- adding the lysine onto the sugar and then taking it off again -- the reaction is accelerated. It can seem confusing that we add steps to the reaction, making the overall reaction longer, but the reaction gets faster. That's because, even though there are additional steps, each individual step is a lot easier than it was before. It's like the difference between jumping across a river and stepping across on a series of stones. Taking the extra steps may be the faster and surest way to get there. The products of FBP cleavage are glyceraldehyde-3-phosphate (G3P) and dihydroxyacetone phosphate (DHAP). 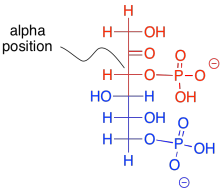 The dihydroxyacetone phosphate subsequently undergoes isomerisation to give another molecule of glyceraldehyde-3-phosphate. This reaction occurs via initial formation of an enol tautomer. It's similar to the isomerisation of glucose-6-phosphate to fructose-6-phosphate that we saw earlier. Figure GL4.6. Isomerisation of dihydroxyacetone phosphate to glyceraldehyde-3-phosphate. So, when the fructose-1,6-bisphosphate forms, it makes one molecule of glyceraldehyde-3-phosphate and one molecule of dihydroxyacetone phosphate, but that dihydroxyacetone phosphate molecule is then converted into another molecule of glyceraldehyde-3-phosphate. Thus, the overall outcome of this part of the reaction is to transform the six-carbon sugar (first glucose and later fructose) into glyceraldehyde-3-phosphate. This is where phase two of glycolysis begins. Provide a mechanism for the isomerisation reaction of dihydroxyacetone phosphate to glyceraldehyde-3-phosphate.